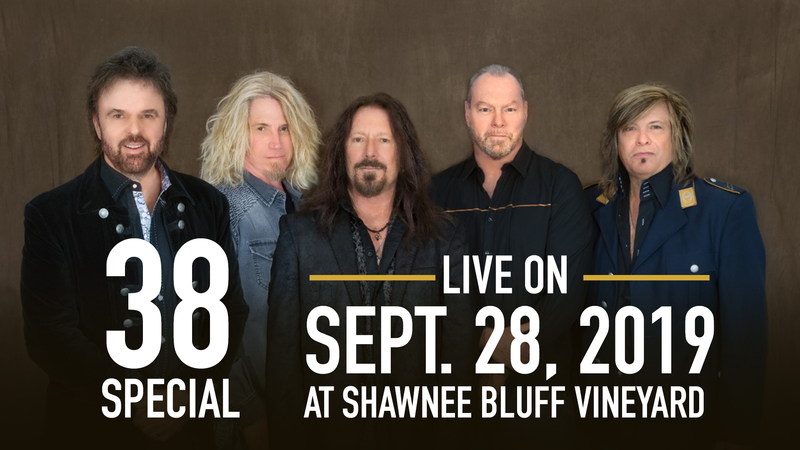 38 Special Returns to the Vineyard on September 28th, 2019! Tickets go On Sale Saturday, March 23rd, 2019 at 8am CST. After more than three decades together, 38 SPECIAL continue to bring their signature blast of Southern Rock to over 100 cities a year. And at each and every show, thousands of audience members are amazed by the explosive power of the band's performance. Their many Gold and Platinum album awards stand in testament to the endurance of a legendary powerhouse. With sales in excess of 20 million, most associate the band with their arena-rock pop smashes, “Hold On Loosely,” “Rockin’ Into the Night,” “Caught Up in You,” “Fantasy Girl,” “If I’d Been the One,” “Back Where You Belong,” “Chain Lightnin’,” “Second Chance,” and more – Timeless hits that remain a staple at radio, immediately recognizable from the first opening chord, and paving the way to their present-day touring regimen. All Shows are followed by an EPIC Firework display by Brilliant Skies. Music on the Patio at 5pm. All Ages Show. Kids 5 and under are free. If a seat is required, a seat will need to purchased. Parking fee is $5.00 and 50% of proceeds goes to the L.A.M.B. charity.